First announced in May 2015, this is huge news for Universal theme park fans. 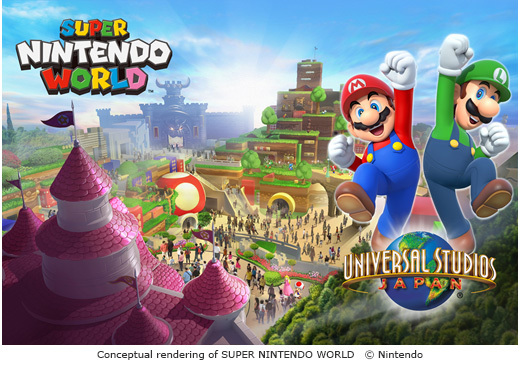 The first Nintendo theme park, Super Nintendo World, will open at Universal Studios Japan in time for the 2020 Tokyo Summer Olympics. The Hollywood and Orlando Universal parks will follow. Construction has just begun at Universal Studios Hollywood, and will start shortly at Universal Orlando. The collaboration between Nintendo and Universal Parks and Resorts will be the next big thing in Universal Parks, and is expected to have a similar effect to the Wizarding World of Harry Potter openings in recent years. It is also designed to give visitors to California and Florida another reason to visit Universal, challenging Disney’s Star Wars Land openings. Nintendo is a huge player in video games, and has been at the top of the game since 1972. Their first foray into video gaming was in a partnership with Magnavox, making light guns for their early consoles. As time went on, they produced their own home video console (Color TV Game 6 and Color TV Game 15 in 1977). In 1981, the hugely popular Donkey Kong was released to arcades, featuring a plumber called Mario, and the eponymous ape. See the bottom of this page for relevant press releases. It seems that the Nintendo attractions at Universal Studios Hollywood are now under construction on the Front Lot of the studio, in the area formerly occupied by The Phantom Stage 28 along with a row of 4 demolished soundstages (Stages 22, 23, 24 and 25), used for projects as diverse as To Catch A Thief, Thoroughly Modern Millie, The Sting, Murder She Wrote, Jurassic Park, Pirates of the Caribbean, Jarhead, Superstore (Stages 22 & 23), and the home of the original CSI series for many years. It was previously thought that the site of the Revenge of the Mummy attraction would be used, along with adjacent underused soundstages. Although the demolition phase is going well, we’re not expecting a finished / open Nintendo Land until just before the Osaka Olympic games in 2020. Japan is planned to be the first Nintendo attraction to open. As the area in in Lower Lot of the theme park is part of the film studio, it’s unlikely to include any exterior attractions. This will give the designers full control of lighting and audio and will enable a fully immersive set of attractions. There will be a themed retail / food area, along with at least two attractions. Past experience suggests at least one of these will be a simulator-type ride, but it would be nice to see Universal Creative looking beyond this type of technology. It could be exploring new technological possibilities of virtual reality and/or augmented reality. It’s also expected there will be some presence of Nintendo gaming systems or arcade games at the exit to the attractions. The area (‘land’) is believed to be themed around characters featured in the hugely popular Super Mario Kart series of games. The entrance to the fully themed area will be through a green ‘pipe’ tunnel, and possibly up an escalator to the second level of the area. This attraction has been confirmed for Super Nintendo World, Japan (see video below, June 2017), and is believed to be the signature attraction that will be featured in the Hollywood and Orlando locations. This attraction is believed to include augmented reality technology, and to merge this with a physical ride experience, possibly using a vehicle track similar to the Radiator Springs Racers attraction at Cars Land at Disney’s California Adventure. A similar system was also used for Test Track at Disney World. At some point during the ride, a tunnel lined with immersive projections will be used to simulate either an increase in speed, or a move to a different location. It’s also thought another part of the attraction will be an immersive jungle land, based on Donkey Kong. It could feature a mine-cart rollercoaster-type attraction with a ‘fake’ ride track which makes it seem as though the ride vehicle is leaping across broken track gaps. Nintendo have confirmed that elements of the attractions will interact with currently available Nintendo portable gaming platforms. It’s thought the name for this new themed area could be Super Nintendo World. This is confirmed to be the name for the land at Universal Studios Japan in Osaka, but it’s not yet confirmed for the other parks. KYOTO, Japan and ORLANDO, Fla., Nov. 29, 2016 — Imagine the fun of stepping into a larger-than-life Nintendo adventure. Gigantic Piranha Plants spring to life. Question blocks, power-ups and more surround you. And Mario and all his friends are there to pull you into a brand-new world.